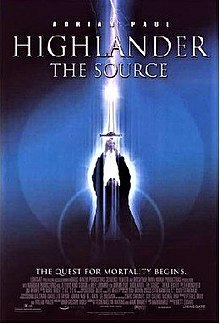 Highlander: The Source, released in some countries as Highlander 5: The Source, is the fifth and final installment of the Highlander film series, directed by Brett Leonard, and was intended to be the first film of a planned trilogy on Sci-Fi Channel though no further direct sequels are currently planned. Adrian Paul reprises his role as Duncan MacLeod from the television series and the fourth film, Highlander: Endgame. Highlander: The Source is the first Highlander film not to be released in American theatres. It was instead broadcast on the Sci-Fi Channel on September 15, 2007. In the near future, a group of Immortals quest to locate the mysterious "Source" of immortal power. One member of the group, Zai Jie, breaks into a communications tower in Eastern Europe and contacts his associates to give them the location of the Source. The Guardian of the Source, who has supernatural speed, confronts and decapitates him. Reggie, another group member, discovers that the planets are moving from their orbits into a cosmic alignment. Former Immortal Watcher Joe Dawson is called by group member Methos to find their mutual friend Duncan MacLeod. Joe finds MacLeod in a fight with the Guardian, shoots Duncan, hauls him into a truck, and drives off. They rendezvous with the others at a monastery to meet with an ancient being known as the Elder so they can locate the Source. At the monastery, they meet Anna Teshemka, Duncan's mortal wife, who is having visions. The Elder meets them all as a group and tells of how, in ancient history, another group of Immortals sought the Source. Upon slaying the Guardian, two of the three survivors were cursed with decay, with one of them becoming the new Guardian, and the other being the Elder (the third, a woman, is later implied to have been reincarnated as Anna). The Elder tells them all to follow Anna who knows the way. She, in turn, receives a vision from the Elder. Meanwhile, the Guardian arrives and attacks Reggie and Joe Dawson on holy ground. In an effort to save Dawson, Duncan throws his katana at the Guardian, temporarily wounding him. The Guardian removes the sword from his neck and breaks it before killing Joe with the broken blade and escaping. After burying Joe, they leave to find the Source, which they have determined to be on an island off the coast of Lithuania in the Baltic Sea. Approaching the island, the boat's captain tells them that the "maniacs", gangs of cannibals, rule the island. After fighting locals who were poised to immolate a man to death, they obtain a van and drive to a deserted house a short distance away from where they believe the Source to be. That night, the Guardian kills Reggie by slashing him to death — the Elder had warned them that the closer they get to the Source, the weaker they would become, meaning that they would lose their immortality. Duncan has replaced his broken katana with a pair of butterfly swords. The group takes Reggie's body with them until they ultimately discover that he will not revive. After burying Reggie, they continue on their way. During their journey, Duncan and Methos conclude that the expression "there can be only one" was in fact never meant to mean that all Immortals must battle and behead each other until only one remains, and that it truly means that only one Immortal can claim the Source. They then find the road blocked, and are captured by cannibals. While the cannibals are distracted by their drunken carousing, the Guardian frees Anna and forces her to accompany him to the Source. Later, Giovanni escapes and takes a sword, hoping to be "The One." Duncan frees himself and Methos, and sets off to rescue Anna. Giovanni gets recaptured, and Duncan goes in to save him. Methos arrives to assist Duncan at the last moment, and tells him he believes Duncan is "The One" due to his incorruptible nature. He rides off on a horse to distract the cannibals, allowing Duncan to chase after Anna. Giovanni, who had run off when Duncan came to his rescue, is decapitated by the Guardian. Duncan finds Anna in a clearing by a sandy pit illuminated by starlight. The cosmic convergence is happening directly over them. The Guardian appears and challenges Duncan. MacLeod finds that he now has the same speed and power as the Guardian, and manages to get past the foe to reach Anna. However, an energy barrier appears to bar his way. After continued fighting, the Guardian ends up buried chest deep in the dirt. Bound and defeated, the Guardian demands that MacLeod behead him. Duncan refuses, and the Guardian vanishes in a blast of light. Before he goes, the Guardian screams that he is "cursed forever." Duncan enters the Source, qualified to do so by his pure heart. In the Source, Anna reveals that she is pregnant with their child. Of the child, Duncan declares that "he is the one." As early as 2001, producers of the previous film, Highlander: Endgame, were discussing plans for a fifth film with fans at conventions. However, the production of the film was plagued with several problems. The original rights holders, Miramax films, decided to sell the rights back to the producers due to the lackluster performance of Endgame. Also, Adrian Paul refused to reprise his role as Duncan Macleod, as he was disappointed with the previous film. At this point, the producers decided to ask Christopher Lambert to reprise his role as Connor Macleod (despite the character having been killed off), but Lambert demanded more money. The producers were left with no choice but to renegotiate with Paul again, even offering him a producer's credit as well. In July 2005, Lionsgate Films acquired the rights to the film under the title Highlander: The Journey Continues, with director Brett Leonard at the helm as director, and actor Adrian Paul in the lead role as Duncan MacLeod. Leonard said: "Highlander is an amazing ongoing story that I can bring my visual style to. Everything I have done has led me to this kind of mythical fantasy." Filming began in October 2005, and concluded the following December. In June 2006, Adrian Paul revealed that Highlander: The Source had been undergoing editing and visual effects work. The actor said that composer George Kallis had been brought on board to create a film score that was recorded by an 80-piece orchestra. production was originally intended to be filming in Africa before it was decided to film in Europe. Lionsgate had originally planned to release the film in 2006. When that plan failed to work out, several release dates were listed in various places; for example, February 2007 was listed in some official The Source auctions, as well as on actress Thekla Reuten's own website, and March 2007 was listed on composer George Kallis' website. Eventually, even the official auctions began using simply a broad "First Quarter 2007" release date. As of February 14, 2007, producers Peter Davis and William Panzer of Davis/Panzer Productions, in conjunction with Lionsgate Entertainment, were editing and remixing the film. Lionsgate finally released the film as a direct-to-TV movie, which premiered on the Sci-Fi Channel on September 15, 2007. Screenwriter Joel Soisson ultimately won a Writers Guild of America screenplay-credit arbitration, and was listed in the final U.S. release's end credits under the pseudonym of "Mark Bradley." Plans to continue the films with The Source being the first of a trilogy have since been abandoned. An early version of Highlander: The Source, which had been shown to distributors in October 2006, was released on DVD in February 2007 in Russia, and was quickly copied and distributed online. These copies of the release began to proliferate across the Internet. The same cut was later released in Brazil, Poland, Romania and Germany. After this release, producer Peter Davis stated that the Russian version was not the final producer's version, and that Lionsgate would release the finished film in September 2007. This was the TV premiere, eight minutes shorter than the Russian version, and featuring different opening and closing narration. Another version was released sometime in Spring 2007 as a Dutch DVD. The Region 2 release was released on January 7, 2008. This is the same version as the Dutch DVD, except in the aspect ratio of 1.78:1. Despite previous announcements and long-standing rumors that a "Producer's Cut" of the film would be released straight-to-DVD and/or theaters in September 2007, the U.S. Sci-Fi Channel aired the film at 9:00 PM and 1:00 AM Eastern, on Saturday, September 15, 2007 as a "Sci-Fi Original Movie". Critical reaction to Highlander: The Source has been universally negative. Christopher Monfette of IGN gave The Source a score of 1 out of 10, saying: "The worthwhile days of Connor MacLeod, it would appear, are officially over—dead, decapitated, and depleted of their power. The struggle for an immortal to move through life unchallenged has since mutated into an awkward arrangement of mismatched mythologies, TV-to-movie crossovers, and a steady stream of low-budget, direct-to-DVD cash-cows which may, in the end, prove to be the only truly immortal thing about this series." Brian Orndorf of DVD Talk gave the film one half star out of five, saying: "The Source is nothing less than a parody of what has come before. If you've seen the previous sequels, you already know that's saying something. There is some relief that this franchise will finally be put out of its misery, because nobody in their right mind would try to keep this series going after watching just how boneheaded Highlander: The Source is." Danél Griffin of Film as Art gave The Source one half star out of four, remarking that "it's bad—cheesily bad, colossally bad, monumentally bad, bad enough to make you never want to watch another movie again bad." Keith Breese of FilmCritic.com gave the film one star out of five, saying: "Not only will Highlander fans be disappointed by the film's nosedive into nonsense, but the average viewer will be stunned by the backyard quality of this film. The acting is uniformly terrible, the special effects are hideous, the sets are cheap and grubby, and the direction is uninspired. The film is an utter failure. ... Surely this is the final nail in the coffin lid for this film series. If it isn't, then something is truly wrong with the universe." The Sci-Fi Movie Page gave The Source one and a half stars out of five, saying: "Just when you think that this is a franchise that can't sink any lower, along comes Highlander: The Source. ... One gets the impression that The Source was filmed with theatrical distribution in mind but that no sane cinema distributor would touch it with a ten-foot barge pole. Good for them. Instead it went straight to the SciFi Channel and now the DVD shelves where you should let it stay, collecting dust." ^ Harry Knowles (2001-09-17). "Highlander 5". Ain't It Cool News. Retrieved 2007-09-15. ^ Paul Davidson (2005-08-04). "Highlander: Going to the Source". IGN. Retrieved 2007-01-13. ^ Paul Davidson (2005-10-21). "New Highlander Starts Shooting". IGN. Retrieved 2007-01-13. ^ Adrian Paul (2006-06-29). "Scoring The Source". AdrianPaul.net. Archived from the original on 2006-12-07. Retrieved 2007-01-13. ^ Paul Davidson (2005-07-05). "How Many Highlanders Can There Be?". IGN. Retrieved 2007-01-13. ^ Christopher Monfette, Highlander: The Source Review, IGN, February 14, 2008.